*Please note: opening times outside the normal business hours (8.30am-5.00pm) are subject to change. 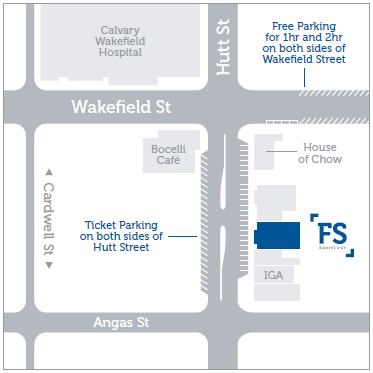 1 hour ticketed parking is available on the Eastern side of Hutt Street directly in front of Fowler Simmons Radiology. 2 hour ticketed parking is available on the Western side of Hutt Street on the opposite side of the road to Fowler Simmons Radiology. The nearest side streets are Wakefield St and Angus St where there are a limited number of 2 hour unticketed parking spaces available. *Please note that patients who hold a Disability Parking Permit are entitled to park in ticketed parking spaces without purchasing a ticket. This is a policy of the Adelaide City Council and is valid for Adelaide and North Adelaide only.